2. Open the GCK file titled G_gamma globin found in the Tutorial Files folder by choosing File > Open… . this file has several identified features that we might like to share with a colleague. 3. To preserve the features in a text format we can choose File > Export.. . and select the GenBank File option from the Format: popup menu as in Figure 2.99. 4. Choose a location to save your exported file, and press Save . 5. Navigate to the location of your exported file and open it using any standard text editor to see the result as in Figure 2.100. Figure 2.100: Part of the Text File Exported in GenBank Format. The GenBank export file format allows you to preserve the features marked in GCK construct files and can be shared with colleagues who may not have access to GCK. 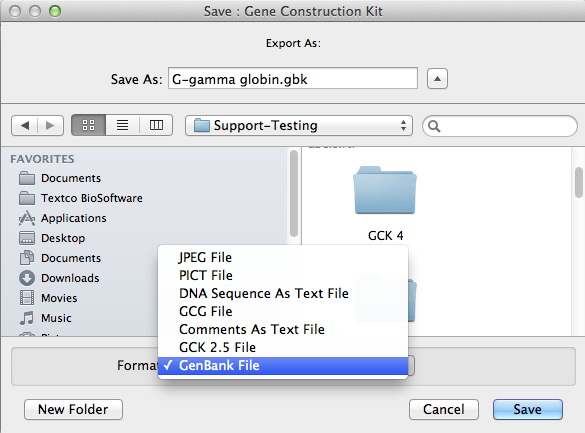 This entry was posted in gene construction kit tutorials and tagged Export GCK as GenBank, GenBank Features, Gene Construction Kit Tutorials, Share GCK Files. Bookmark the permalink. Trackbacks are closed, but you can post a comment.